“It all started back in the early 70s, with a group of franchisees from California who decided it would be of benefit to each of them to get together once a year and exchange ideas, and just have a good time. The founders of this organization were Russ and Dennis Hoffman, and C.W. Romick from Southern California, and Al Wray and Earl King from Northern California. In the late 70s, membership was nearing 50. Franchisees were coming from as far away as New York State to attend the annual convention in Lake Tahoe, Nevada. In 1980, due to continuous growth, the founders felt it necessary to incorporate into The Western Roto-Rooter Franchisee Association. It wasn’t until 1983 the true significance of the Association came to light. Just three years prior to this, Roto-Rooter Corporation was bought by W.R. Grace & Co. which subsequently became a wholly owned subsidiary of Chemed. During 1983, major changes were made in the Franchise Agreement. These changes were of such magnitude that within a matter of days, franchisees from coast to coast were communicating their concern. The fact such communication could even take place was largely due to the Western Roto-Rooter Franchisee Association. With so many franchise owners stating their objections and taking into account the number of franchise agreements up for renewal, it was decided a meeting should be scheduled to review these documents as a group, and to hear professional opinions at the same time. A meeting was held at the Hilton Hotel in Chicago, with 15 of the largest Roto-Rooter franchisees attending, along with attorneys and two certified public accountants. A phone call to Des Moines conveyed the feelings and legal position of the franchise owners regarding the new Franchise Agreement. That phone call resulted in a meeting being held with Roto-Rooter Corporation which generated a livable Agreement. These expenses of the legal representation and interpretation of the proposed Franchise Agreement were paid for by the members of this Ad Hoc Committee. If you have never had the privilege of reviewing the proposed Agreement, it would be difficult for you to appreciate the efforts of this committee, or to understand the position you would have been in, had you signed that Agreement. Click on image to read a history of Roto-Rooter. It was now the time to build a national association with communication as a cornerstone. For the first time in history, Roto-Rooter franchisees would have an open line of communication from as far north as Alaska, to as far south as Florida. Since this dream was not shared by Roto-Rooter Corporation, our first stumbling block would be obtaining a list of the names and addresses of franchise owners. This was somewhat accomplished by word of mouth and the use of Ma Bell’s directories. In an effort to obtain new members, the Association felt it best to move the convention around the country. The Association also believed the prime way to communicate would be to publish a bi-monthly newsletter that would list the regional directors and their phone numbers. 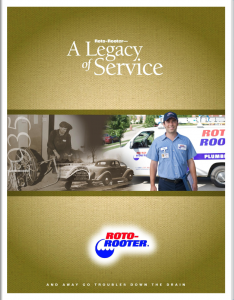 Rodney Wray, northern California franchisee wrote this history as a forward to OWNING A ROTO-ROOTER FRANCHISE, authored by northern California franchise owner, Joe Bristol. The RFFA wishes to thank Rodney and Joe for this contribution.